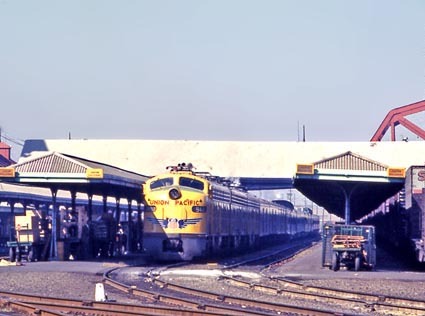 Here is Amtrak's San Francisco Zephyr on the Southern Pacific in Berkeley, California, in June 1975. This was at a low point for transcon service to the Bay Area. The California Zephyr and its ride through the Colorado Rockies was no more, and the SF Zephyr, which ran over the Burlington to Denver from Chicago, and then up across the Union Pacific and SP into Oakland, was a hodgepodge of old conventional equipment, including a Slumbercoach and a dome lounge, which sometimes made its appearance between Denver and Oakland [it was not on the train I photograped, nor on one or two I rode]. In its last years on the passenger hating SP, the City of San Francisco had been allowed to deteriorate seriously despite the best efforts of the UP and Milwaukee Road, and it took Amtrak's Superliner equipment and rerouting back across Colorado to restore quality service. I first met the UP's City of Portland-City of Denver domeliner in 1964, when I lived in Laramie, Wyoming. A couple of times a year I would take it back East to visit friends and family. Running from Portland to Chicago via Pocatello, Laramie, Denver, and Omaha [where it took to Milwaukee Road rails], this was a very fine train: friendly, relaxed, and beautifully maintained. And, it had a wonderful dome diner offering fine food and spectacular views. 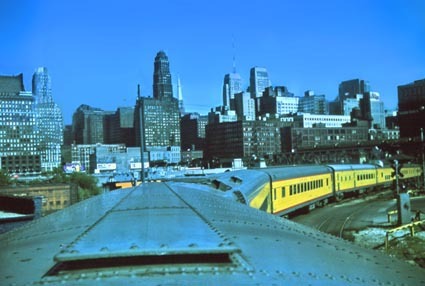 Here are two shots, one taken in Portland in 1968, the other on the approach to Union Station in Chicago four years earlier. Raymond Loewy's GG1 electric locomotive is a triumph of American industrial design. Unlike his classic Twentieth Century Limited, an equally stunning production, the GG1's survived many generations of power and mergers -- and, well into the Amtrak era, was eventually relegated to freight and local runs before it was retired. This photo was taken on a rotten New Jersey winter day in the late 1960s in Metuchen, New Jersey, of a Pennsylvania Railroad GG1 hauling a Boston-Washington Colonial at high 100mph+ speed. One could hear the engine's hum well before it came into sight and then passed by in an almost silent magnificent rush. Growing up in Northern New Jersey, the Lackawanna Railroad and later, the Erie-Lackwanna, were an important part of my life. My father commuted for much of his working life on the Boonton and Morristown/Dover Lines and old MU trains were, via Hoboken, my way into New York for jazz and adventure. 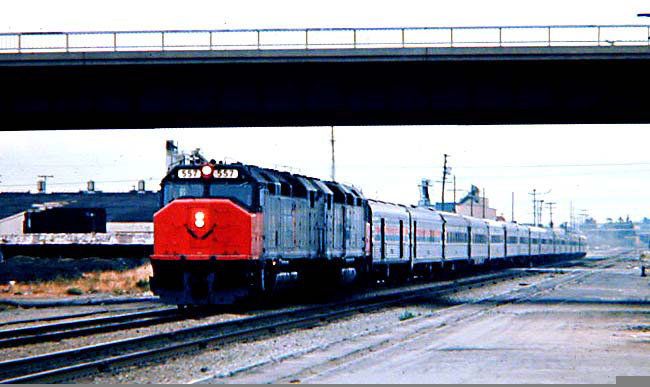 As a college student I had a memorable trip on a 22 car Phoebe Snow to Buffalo, where I connected to a Nickel Plate sleeping car for the ride into Chicago. Here are two photos which capture some faded glory. 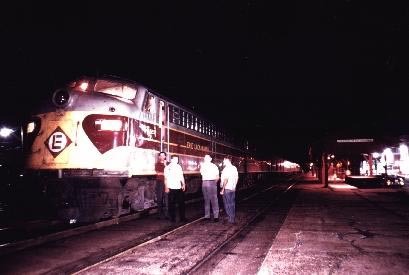 The nighttime shot is of the Lake Cities, varnish run by the Erie-Lackawanna from Hoboken to Chicago via Youngstown, in East Stroudsburg, Pennsylvania in the late 1960s replete with sleeping car, coaches and diner . 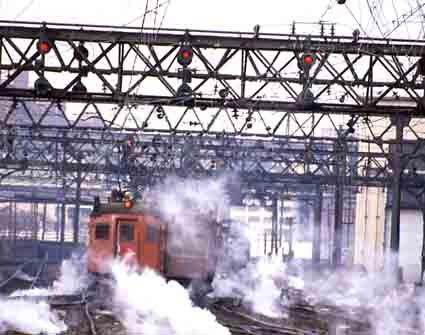 The other was taken of a set of MU's arriving in Hoboken on a frigid day in 1982. The Erie-Lackawanna is now gone along with long distance trains which graced Hoboken and line which ran from there to upstate New York though Eastern Pennsylvania. Modern New Jersey Transit trains ply the Morristown/Dover line, sharing that duty with others from Penn Station in New York.